The island of Barbados in the Caribbean is famous for its year round sunshine and great natural beauty, which makes this one of the world’s top travel destinations. 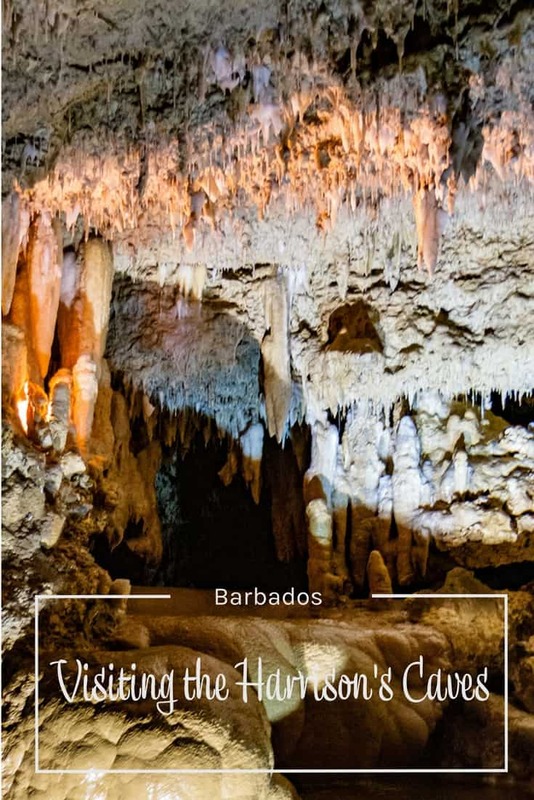 If you want to discover the hidden beauty of this Caribbean paradise then you should make sure to visit Harrison’s Caves to take advantage of a rather unusual and not very well known site in Barbados. The Harrison’s Caves are one of the island’s most popular attractions and surprisingly this stunning cave network was lost for nearly two hundred years until it was rediscovered by Ole Sorensen and Tony Mason back in 1976. The caves were established as a tourist attraction in 1981 and since this then, the caves have been receiving a steady stream of trekkers and daily visitors. 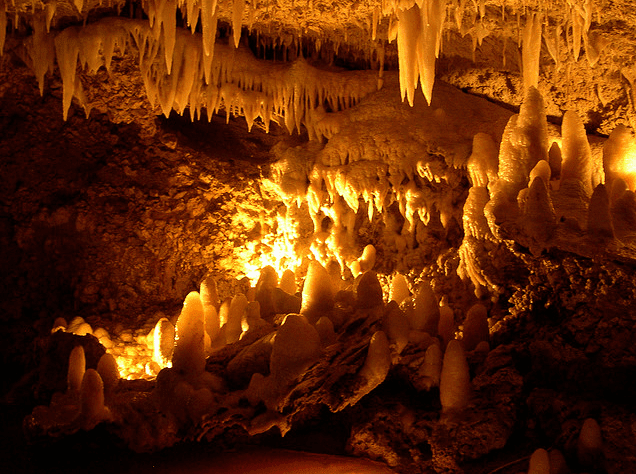 The caves were formed naturally by water erosion which passes through the limestone rock. 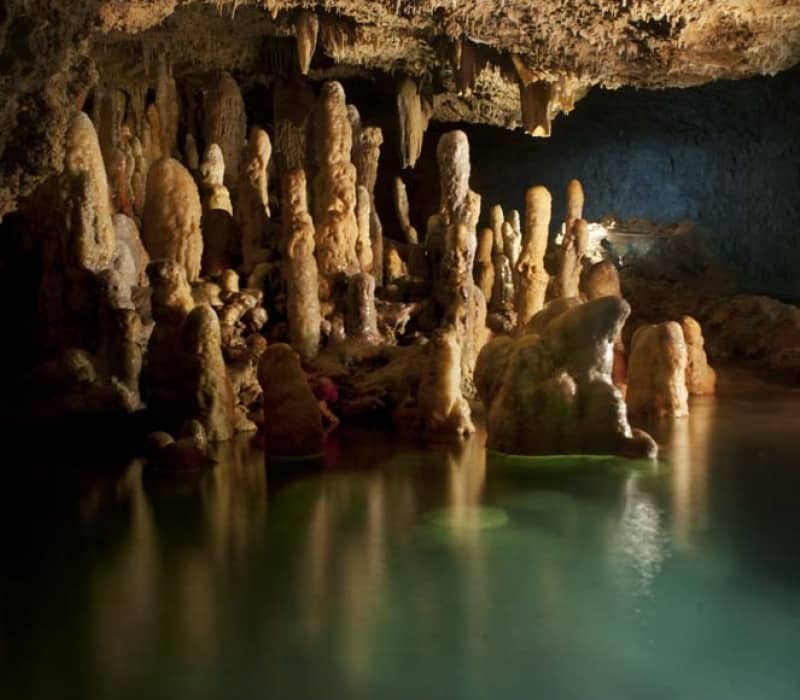 This water here is rich is calcium and as a result, the buildup of calcium has formed a number of pretty stalactites and stalagmites, many of which have been built up to form unusual shapes over the years. When the light hits these natural rock formations they appear to glisten as if made from tiny diamonds and the effect is simply enchanting. There are a number of different ways to visit these impressive caves. An electrically operated tram runs through the caves and this is an excellent way to see them in comfort and style. The tram ride takes an hour from start to finish and makes its way past a number of stalactites and stalagmites as well as emerald pools, crystal clear streams, and an impressive waterfall. Trams run daily during the cave opening hours of 08:30 to 16:00 and this is an unforgettable experience. Alternatively, visitors to Barbados can book a guided eco-tour of the caves. One of the great things about taking this tour is that a knowledgeable local guide is on hand to point out flora and fauna that are encountered along the way and provide information about the caves as well as the surrounding environment that makes this part of the world so special. See more spots I am curious about in the Caribbean in my AFAR Wanderlist. How about you? Have you been to this cave or any other really cool cave around the world? Okay, the caves are kind of creeping me out! I know that they are interesting and carry a history, but it looks a bit slimy to me and I know I wouldn’t make it through without a barf bag. Sorry, just can’t stomach some things. Sometime I will come and visit this! @Maria, please do, I am sure you will find it to be an experience. @Elena, I never thought about it that way…looking at warm photos when it is cold outside, great idea! Amazing what beauty lies beneath us! Will definitely check this out! Thank you! @Catherine, I know, I am always amazed to stumble upon these things. Wish I were there! I LOVE rock formations-clouds—any of the wonderful sights to see!! @Tina, my hubby loves that, check out some of my Utah posts – the rocks and clouds are phenomenal. Wow..I am in awe at some of the beautiful things created in nature. How fun it must have been. @Jessica, I am constantly surprised myself. That is one of the wonderful things about travel. Wow, its awesome and reminds me of Rio Secreto: Mexico’s Secret River and cave located near Playa del Carmen, thanks for sharing. @Sita Madu, now that you mention it, it is very similar! Oh how I love caves. We have quite a few in our state/area. I love the ones with water too. Caves are just so beautiful. @Paula, what state? I have visited some caves in the US and want to do more! Southern Indiana. Have you been here? @Paula, no but now I am intrigued, I need to check that out. These look so cool! I need to put this on my list of places to go!! Everytime we go on vacation we try to visit a cave. We stayed for our Honey moon (camped right next to a water fall) and we went on an underwater cave. Spookes cave in Iowa! I loved it. I would not suggest sleeping next to the waterfall to anyone I had to pee soooooooooo much. @Dariene, that is so cool, I have been to a few caves but not nearly enough, they are so fun to explore. I’ve never seen anything like these caves before. Someday I know I will get to Barbados and take a long look up close! The pictures are stunning, I can only imagine what they look like in person. Maybe I will get there someday. I love the Islands, hope to vist cave. I love stuff like this. We have a cave/cavern about 15 minutes from where I live and it is always fascinating to me no matter how many time I see it. The fact that this cave is in Barbados, which just conjures up warmth and pretty blue water right now in the midst of our snow and greyness, makes it all the more enticing. These pictures look awesome! I wish you posted more. Hopefully my family and I could visit this eerie looking cave. We love to travel. Thanks for sharing. Gorgeous photos! I love touring caves! Its amazing that these kinds of thinrtgs survive through all the modern world and it’s pollution etc. I think it is amazing and a beautiful blessing provided from God. looks really cool. i would love to go here. i love caves and cave diving. I’ve never been to Barbados. I hear it’s a lovely island. I had no idea it had caves to explore, though. The Harrison’s Caves look fantastic in your photos. Thank you for letting your readers know about them. These look awesome1 I have been a huge cave fan ever since my husband and I visited the Luray Caverns (http://luraycaverns.com/) a few years ago. Nature is phenomenal! @MD, it is amazing I am discovering all these caves people keep commenting about that I didn’t know exist, I love it! I’ve never heard about these, when I think of Barbados it’s all about beaches and glamour. Great! I love the pictures. They make me feel as though I am there. We have caves on Vancouver Island that I have scene. They are really quite interesting to learn about. I’ve been to several Cavren’s in the United States and they are all amazing. You certainly can’t say “if you seen one, you’ve seen them all”. I recommend them to anyone. If we ever make the trip I will make sure to go it looks like real life magic. I have been to these caves and it is simply amazing! It looks so beautiful! I want to go! Our family enjoys visiting caves. I wish we would have known about these when we went to Barbados five years ago. We have said since visiting the island that it is on the top of our list of Caribbean islands to go back to and have an extended vacation there. Now we have even more reason to make it happen sooner. Hi we have a similar cave experience @ Shasta Caverns, located just north of Redding Ca. I have also found several along A-12 in Big Springs.. They are absolutely breathtaking, just as this one. Thanks for sharing this review and the wonderful pics. I would love to visit these caves. We have done some here in Texas. These sound really cool and look like a great experience. @Karen, what are the caves in Texas? I used to live in El Paso and I remember visiting caves in New Mexico, love to hear where they are in Texas. That’s so cool! I’d love to visit a cave. I find this fascinating and creepy at the same time.I love that other people explore these caves and give us feedback and intriguing insights on what they discover but going in there myself just wouldn’t be me. However I was brave enough to go through the Bonnechere Caves in Eganville Ontario with a tour group and that was pretty awesome. How interesting! We love to travel and see new and exciting places. This would probably top them all. Great place for exploration! Those pictures are beautiful! Thanks for sharing them. I’ve never been in a cave like that!